As it relates to weapon retention, the video below is more for entertainment and probably falls into the "Dumbest Criminal" category, but it also helps illustrate and important point about staying in control of your gun. Under extreme stress--in this case robbing a convenience store--the bad guy loses focus on his weapon and before he knows it, the weapon is taken and then turned against him. If you ever find yourself in a situation where you have to hold someone down at gun point, work hard to break out of that deadly tunnel vision so you can focus on everything around you. Doing so will make sure you can see if the bad guy has buddies who are looking for the right opportunity to close the distance and strip you of your gun. In the rare case that someone does decide to go after your gun, you need to have some conditioned weapon retention techniques pre-loaded in your personal defense tool box. Personal weapon retention falls into two basic categories: 1) the weapon is still holstered or 2) the weapon is unholstered. 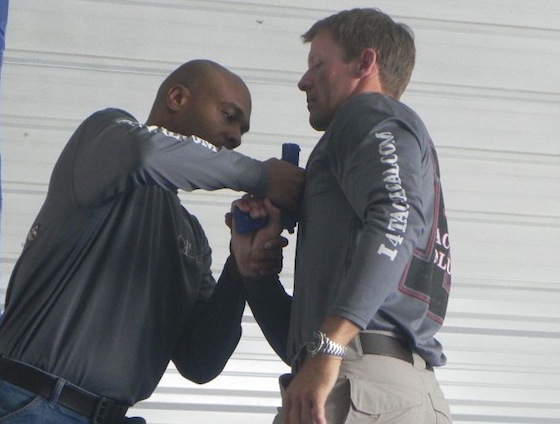 If holstered, techniques should focus on keeping the bad guy from unholstering your weapon until you create space to deploy it safely. The unholstered techniques focus on using the weapon as a lever against the bad guy's grasp. It should defeat his grip so that you can gain distance and/or bring the weapon into the fight on your side, not his. There are numerous techniques available and we will be covering a few in the upcoming season of PDTV. Whichever retention technique you choose, make sure you practice it so much that it becomes an automatic response to a disarm attempt. Then practice it some more. Train Safe.